I must say that I find the list of improvements in PowerPoint 2010 the most interesting in comparison with the innovations that Word 2010 and Excel 2010 should bring. 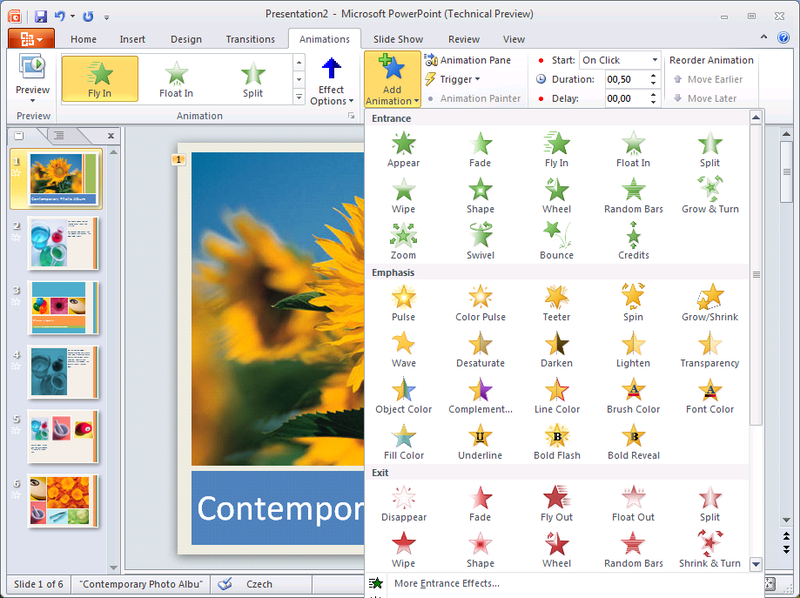 As well as other applications from the MS Office 2010 package, the new PowerPoint is equipped with the improved Ribbon tab bar along with slight changes – rounded edges and light colour instead of the original blue. The Office circle has also disappeared, it was replaced by a red button in the beginning of the Ribbon strip. This button is used to switch into the Backstage mode that allows you to save documents, open templates, print or set sharing. We will go through the changes and innovation by individual cards in the Ribbon strip, in the end I will add a list of other new features that PowerPoint 2010 offers. At the first sight the basic tools in the Home bookmark are exactly the same as in the previous PowerPoint version. Upon closer inspection you might find some new items in the SmartArt shape offer, as in other MS Office 2010 programs. The button for slide removal in the Slides section was replaced by the new Section drop-down button. 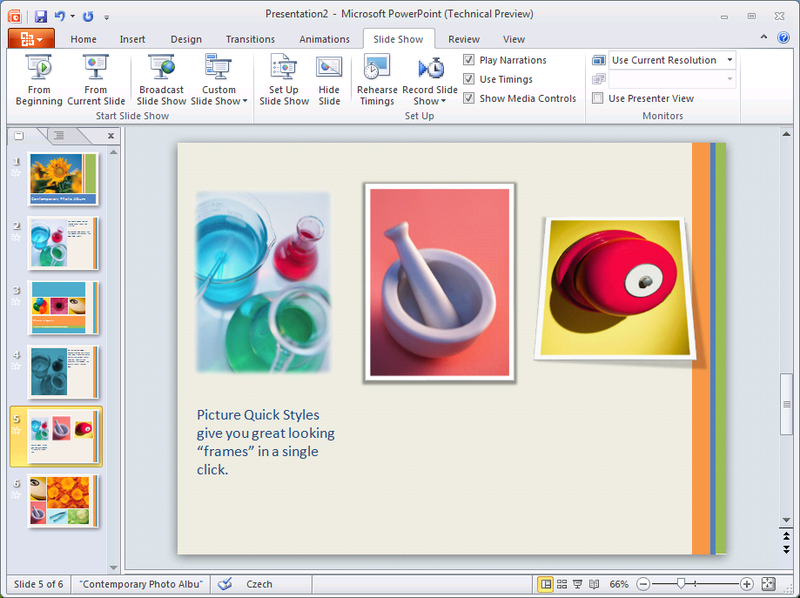 That is to say that PowerPoint 2010 offers grouping of slides into logical sections for easier navigation. I must also mention the live view for objects inserted from clipboard and the modified appearance of the context offer and of the panel that appears at elements that have been inserted into the slide. 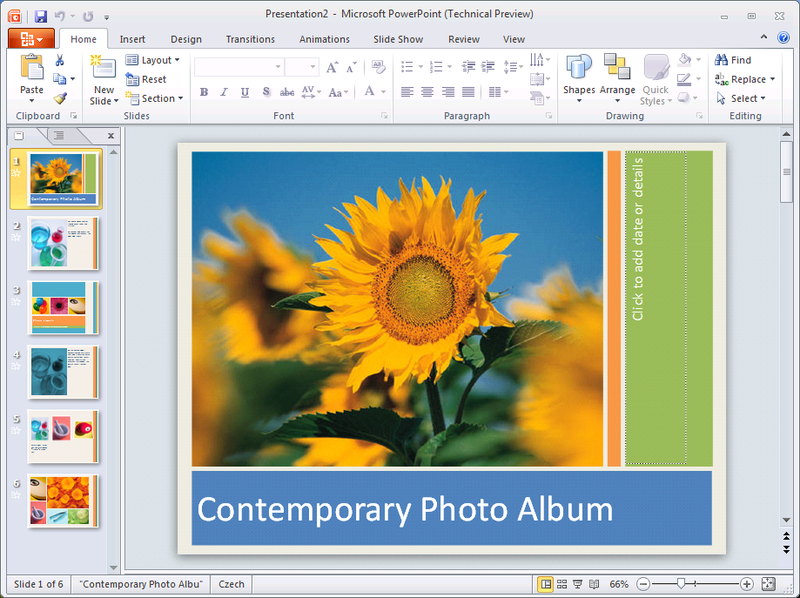 I am not sure whether you will appreciate the possibility to capture screenshots in Excel and Word, but I find their use in PowerPoint 2010 and the possibility to insert them into a presentation slide quite useful. Directly in the offer under the Screenshot button you will find previews of other windows so that you are just one click away from inserting their image into the presentation. Using the Screen Clipping function you can crop any part of the picture. 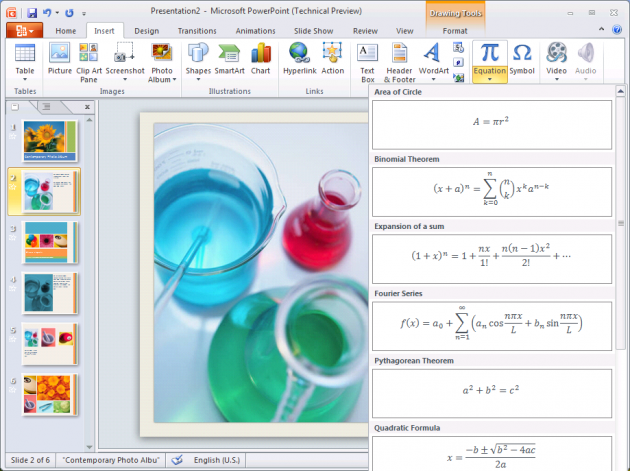 Just like in Excel 2010, you will find separate buttons for inserting symbols and mathematical formulas. 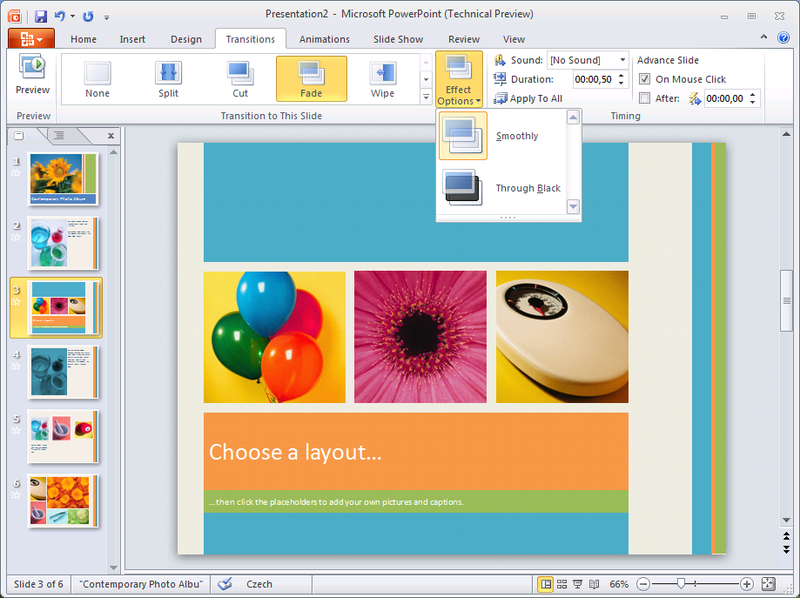 Like the other applications, PowerPoint 2010 offers improved editing of inserted images, such as background removal, cropping into shapes and ratios, image layout, new effects etc. Nothing has changed in a way individual slides are designed. In PowerPoint 2010 you will find the same functions with the same looks as in its predecessor, PowerPoint 2007. On the contrary, the separate Transitions card is brand new. It serves to the very purpose its name suggests. It allows you to define transitions between individual presentation slides. Before you could do this using the Animations card. PowerPoint 2010 is more detailed in this respect. The reason why a separate bookmark for transitions had to be created is that there are many new functions on the Animations card. Individual slide elements can be easily animated independently This was of course also possible before, but now you can use many new animation types and, above all, they are much easier to work with. Concerning animations, PowerPoint 2010 is not limited to a single inconspicuous drop-down offer as its predecessor was. Using the Animation Painter tool you can easily copy animations from one object to another. Slideshows will be easier to show as well. PowerPoint 2010 supports the Broadcast Slide Show that allows you to remotely upload the presentation into a service waiting at a given web address. Viewers will be able to watch the presentation using their web browser. When showing the presentation, there are several daintinesses that I like – they allow you to check whether you want to use the timing, play dubbed commentary or show the presentation’s control panel. On the Review card you will again find newly separated buttons for translating the chosen text into different languages and, above all, the card offers extended possibilities of tracking changes. Where PowerPoint 2007 provided only inserting comments, PowerPoint 2010 offers a whole revision system complete with rejecting, approving and comparing, as we know it from other MS Office applications. The last card, View, changes the offer of slide views. Instead of the Presentation button you will find a Reading View button that launches the presentation, only it is not in a full screen mode – it fits into the current PowerPoint window. 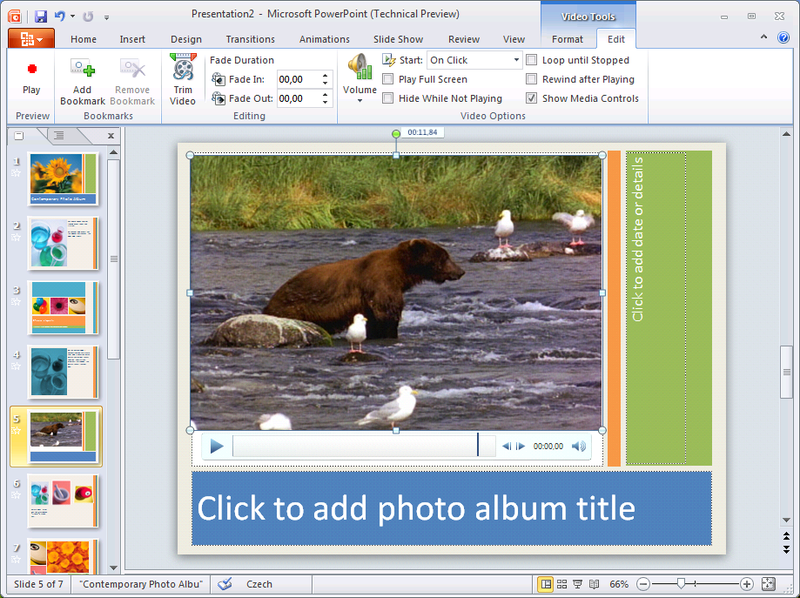 The possibility to edit video inserted into a slide directly in PowerPoint is a total newcomer. As soon as you insert and highlight the video, new Format and Edit cards appear that replace the previous Format and Options cards. It is not only the name that changes. 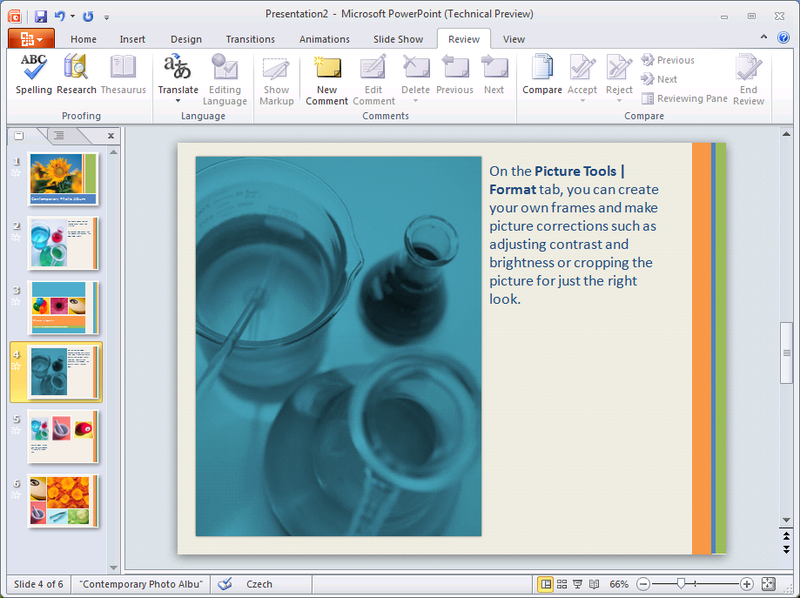 You can cut out unnecessary parts of the video, add fading or bookmarks – all that directly from PowerPoint. You can also choose whether you want the saved video to have the controls visible or not. 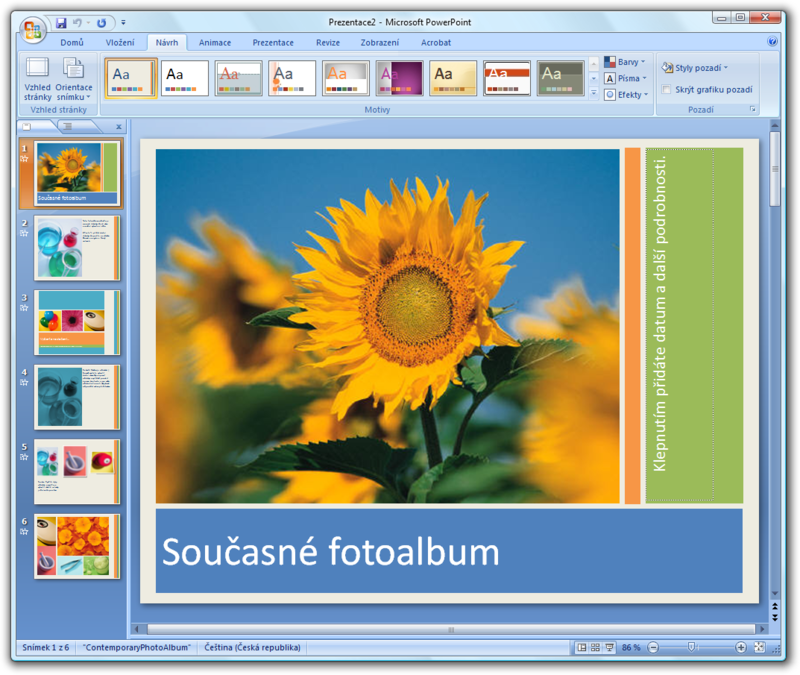 There is quite a lot of changes and innovation that PowerPoint 2010 brings and they are not limited only to the application’s design. I think that those, who devote themselves to presentation creation more often, will without doubt utilize the new elements and that the investment in the new PowerPoint version will pay back. Note: This article is available in Czech version První pohled na MS Office 2010 - PowerPoint 2010.